I like them both, but I lean more towards the UK version. I really like them both! But if I had to choose, I like the U.S. one. I get drawn to the purple cover because it's, not only, my favorite color, but the sword with reflection is very eye-catching. I like the purple one, the sword is intriguing! I like the 2nd one better, mainly because it carries out the theme of the previous books. I like the U.S. version. It's different from the actual series book covers, so you know that it isn't part of the series, but it's close enough that you know that they go together. I like the US version the best. While the UK version lends itself better to matching the rest of the series, I far prefer the US version. The UK version. It matches the earlier books in the series. I do like Purple, but I hate it when a series changes the coloring mid-series, because it never looks cohesive. I really like the purple cover! i like both of them but i think purple one looks more interesting. second one looks like it belongs to HoN series but its not. first one is you can understandits about HoN. i think purple one is the best. The UK version matches the other US covers! I vote for the UK version!!!! I like them both, the second one is more in line with the covers of the rest of the books, however the 1st one seems to really fit well for Dragon. I like the first one best. The Us Version , It looks much more interesting! i love them both but i def. have to go with the UK cover! I like that the UK version matches and gives you the ability to still keep the idea of what the characters look like in your head. Though I love the photography and graphic work done to make such a beautiful looking sword so I'm 50/50. I think the UK version matches the rest of the series. The purple one is pretty but looks like a totally different series. I might try to get a hold of the uk version. I like the US cover best because it's different from the series, but you can tell it goes with the series. For sure the US cover! The US purple one definitely. The other one is too much like the original series, it might confuse people thinking it's part of the series and not a novella based off of it. US version. It's very eye catching. although the purple looks like a renisonce romance cover a bit. I like it much better with some changes. I think it would be much better if in the reflection of the blade was a girls back with tattoos down her back and her looking over her shoulder with a look of (i will be avenged on her face) and it needs to have a little more shadow so u really cant tell if the hair is dark or light and the left side of the blade should have tattoo etchings all down the side that way it stands out and is a little different from the other covers but is still fitting with the series. just my opinion. They are both beautiful but the blue one is similar to the House of Night series and would be easily recognized & it's pretty! 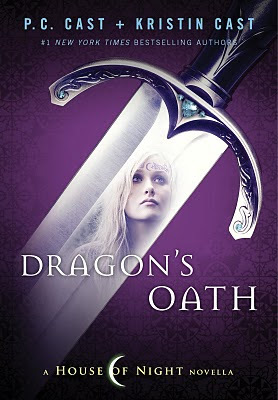 My vote is for the US cover because it's purple (my fave color) and because of the sword - it being Dragon's weapon of choice. I also like that it doesn't match the rest of the US HON books - because relly, these Novellas are not part of HON, more like they are extensions of HON. Another thing I like about the US cover is that Anastasia is represented. And since the Novella is about both of them, their history and relationship, I think it better represents the story that will be told. Plus, the guy on the UK cover doesn't say "Dragon" to me. I think both are awesome, but the US one is my favorite. We have Anastasia in the cover, and I believe the referred oath is about her (can't be sure, but I'm eager to find out! ), so I guess it reveals something about Dragon and the man he is, even though grief and mourning might be twistin his heart now. So yeah, I think the US cover is my favorite! Defiantly the US version. It's prettier and more detailed. The UK version is just a blue guy with the usual HoN-themed designs. A bit boring really... I like that the US version is different from the usual HoN book covers because it's just a novella and not really part of the main series. If my opinion worth, I really liked the UK version, but I would buy both of them. Gee did I start something about cover preference with my previous blog posts??!! As you know I like the US one. Although yes the UK matches the previous covers more closely. For the most part, US covers are generally more exciting then the OZ/UK covers. But that's just my opinion, some may disagree. I love the U.S Cover, the U.K is okay but it just seems kinda boring compared to the U.S cover. the blue/black cover is my choice. I love the U.S. version. the sword with the reflection draws more attention. They are both great covers. I love the sword on the US cover. However, the UK cover fits with the covers of all the other books in the House of Night series. Hum...interesting comments guys! I feel like a lot of you do. I love the purple and the sword, and I also like seeing an image of Anastasia (yes, his oath does have to do with her). I also think the blue is pretty, and I think the dragon swirls in the black tattoo design are nice. I don't particularly like the matching aspect, though, because even though the novellas are set in the HoN world I don't want them to be mistaken for HoN "books." So looking different, set apart, is cool with me. Oh, and for those of you who like the books to look like a set, what I believe my US publisher intends is for all of the novellas to have a similar look. Purple, but the blue matches the series best. I like them both but I personally prefer the UK version better. I prefer the US version, but both rocks, I must say. I like the blue/black one best. I can't wait for sales to start in the Netherlands! I definitely prefer the UK version the best. Fits in with the rest of the books in the series. The sword is a cool idea, but maybe incorporate it with the UK version? I am from Brazil and I really like the purple one. The sword matches with him. I really like them both. But I prefer the U.S. one. They're both cool, the UK one matches the rest of my HoN books, and it's always nice to match. But the US one is really cool. It's more relatable to Dragon, with the sword and him being the Tulsa HoN swordmaster and all. There won't be any posters printed on the inside covers, but there will be an illustration for each chapter! Kim Doner is my illustrator - the same artist who worked with me on THE FLEDGLING HANDBOOK. The artwork is awesome! The first one is absolutly amazing, but the 2nd one looks more... mysterious. I like them both but the UK version's pattern matches the rest of the series, creating something to tie them all together. I like the first one best but the second one would be a better match for the HoN series because it stays in theme and color with the rest. I like the first one because it is very eye-catching. i like the US version alot! Honestly, I think that if you made a combination of the two. Since Dragon is a swords master, I think you should put Dragon in the sword's reflection and then make the cover blue and black. I think that would be amazing. If I had to choose though. . . it would be the UK version. I like them both, but my vote would definitely go with the purple cover. Very eye-catching! I like both, but I like more the purple. It's more House Of Night... The blue is more Zoey history. I think that the purple is very good... It's beautiful in really :) kiss! I love the way the second one looks because it goes with the rest of the books that have been put out from the HON series! I heart all of your books. I like the UK version better, because it matches all the ones i own, it would be sad to break up the set. Thought i do love the purple cover, i'd choose the UK cover. I like the purple one. I think it is much more of an eye catcher. 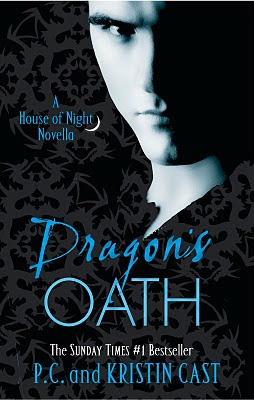 I also like that it has a pic of Anastasia, because she is dragons oath. I would pick the UK cover because it matches the rest of the books. The only thing is that the font of the title is different. The UK version. It's really beautiful, and it's so cool! But actually it doesn't matter. I will buy anyway! I like the matte/gloss background on the black & blue, since it goes with the previous books. But I like the font and color on the purple one better. In regards to the picture, I like the image of the sword but I would replace the girl with a picture of "Dragon", or at least have them both pictured. The blue UK version is my fave & it looks more like the other covers. I've got to say, I prefer the UK one and I have done for the entire series, there's just something about the US ones that I just don't like. I like the top one with the sword...awesome! The blue feels more like HON but the purple is a much better cover overall however the blue is very good, but to appeal to me i think it needs a font change. Barbara - Dragon is a Sword Master, not just a fencer. The sword on the cover is representative of a sword his father gave him in the early 1800s. The girl in the sword is Anastasia. I honestly like the Purple one better!!!! Anastasia is just gorgeous!!!!! Love both covers! The blue cover goes better with the HON series & the purple cover looks more like the Goddess novels. I like both of them & I'm a teen. So what ever you decide I'm cool with it. The first one with the purple cover and probably Anastasia's face on the cover! It's really pretty, probably because I like purple and the sword is very eye- catching! I think like Ashlee: "I like the U.S. version. It's different from the actual series book covers, so you know that it isn't part of the series, but it's close enough that you know that they go together." the second one looks more like the rest....and why stop the trend? For the first time, I have to say I favour the US cover. I would buy the purple one. put the sword on the blue/black cover and it will all look much better. I like the purple one because it's eye-catching and unique. However, the blue one follows the rest of the series. i would buy the US Cover. i like to think the woman is anastasia and it leaves alot to wonder of the relationship between dragon and his wife. can't wait for the release.. The second one goes more with the others, however, i like the first one more. But the second one might make you more money because people associate the black with intricate designs to the house of night series. In terms of marketing, i would say go with the second one. Definitely the UK one.. It looks like all the others I've got.. US one is prettier though..
Will you be doing all the other books in coloured pages.. I'm currently missing Burned and Awakened with the coloured pages.. I may have to resort spray painting the side of them myself if they don't exist.. I like the US version more! I love it! i like the U.S version better! I like the layout of the first one but I like the fact that the second one matches searies. cant you somehow combine them. like leave the sword with the reflection but use the background and the font of the words on the second one. and leave a slight purple or blue glow from behind sword. I think that might appeal to everyone. it would be slightly differant than other book covers but leave plenty where it would be easily recognized as a set. I like both as well however, I like the first one better since it would resemble the title of the book. Don't get me wrong, i love the uk version, but still leaning towards the us. Can't wait for it either way! But, if I owned the UK covers, I would like the 2nd one better. I have an obsession with having my books match. If not for the fact that this is a novella, not the next book in the serious, I would be upset that you changed the US cover style :P That's just how I am. I suspect the UK fans will like theirs better because it's consistent. I have to agree with the comments that I have read so far. The UK version seems to fit in more with the House of Night books. I would consider buying it so that it would blend in. However, I personally really like the US cover. I really like the reflection of Anastasia (at least I assume it is her) in the sword. The way she is looking away into the distance, it makes me feel that we are seeing her as Dragon saw her for the first time - not in a direct interaction, but in a "I saw her from across the room" kind of way. That may be silly, but it's the way I view it, and that interpretation endears the US cover to me more than the typical brooding male on the UK does. Additionally, since it is a HoN novella, and not strictly in the main series, I think it should stand apart. Especially if there are more to come. The UK version is cooler. Honestly the second one isn't that great. Yeah it's like the others kinda, but I don't know not really attracted to it. The first one (the purple one) fits more with Dragon personally. Loving the US one!!! I like the purple one because it DOESN'T match the House of night series. ;) After all, it isn't really a book of the HoN series, but a spin off, so I think one should also see it in a cover. I like the one on top. while they both have their strong points and weak points, I would for sure pick the US version. Even though the picture on the UK cover "matches" with the other books more, this book isn't exactly in sequence with the other books anyway. The US cover goes better over all. The tone and the typography are much cleaner in the US cover. The US one matches just enough to know it a HoN book, but it stand alone in certain ways too. Overall, amazing design. I like the first one; Where her face is reflected in the sword. The purple one is gorgeous! It looks more professionally done. The second one looks a little photoshop-y. Both nice, though. Anatasia is BEAUTIFUL!!! And the sword is cool!! I would choose the purple version with the sword and reflection of Anastasia. I think it's beautiful. 'Easy peasy' as the twins would say. The black, UK version is easily the better version. I love purple. It's probably my favourite colour but the black cover wins by miles. P.S Could you write them a bit quicker please! I love the U.S. version! I would have to say the UK cover. I would like to have it match the other covers from the other books. I love both though. i love the U.S. version it is absolutely amazing! I like the UK version better. I like that it fits with the series, because even though it is a novella it is still a part of the series. I'm one of those people that is OCD about books in a series flowing. love love LOVE the u.s version. Lets mix it up from the old face-on-book theme. I think that it has a lot more depth to it, making you wonder about the relationship between Dragon, his sword, and his wife. I really can't wait to read this. :D And I'm going to love the fact that it's different than the other house of night serie's books. I really like the change. Keep up the good work PC. The purple one definitely! It catches the eye so well! I like the purple one better, but its the storyline that sells me. looking at the two covers, i would have to say that the UK version looks better, although the sword is wicked cool. If i could i would buy them both for the collection. I think they are both beautiful but since it's dragon's story I like the second cover but I would like to know the meaning behind the first cover. The purple one is the best. For me, the blue seems like it was well done, but by an amateur person with photoshop. Sorry! That's just my opinion though. What would be really cool is if the guys face was faded into the back ground of the purple because for me the face is the only thing that brings any umph to the blue cover. Again, just an idea. You guys are the professionals and I'm just the person obsessed with the series! Either way I'm buying this book the second it comes out! i love the first one its sooo pretty. I like the first one but the second one looks more like the books I already have in my collection.... Even though the second one looks like the ones I own already; I have to say that I am leaning more towards the first one (The purple one with the sword) P.S. I love your books and I hope the series never ends!!!!!! I just love the purple one it is amazing ! I hope in my country (Turkey) The Cover going to be purple one. I may be from the U.S. but the sword is kinda like The red flegling poet's poem about the double edged sword! The 1st one looks best but the 2nd matches the other books. I like the one with the sword that is purple but the othere one is good too. I love the UK cover better. I'm one of those people who like buying books in a series who's covers match, and the UK book covers are more eye catching and mysterious..
PURPLE!I love the purple one better because yo tenga mas ganas to read it.I feel like reading it more. From America I'd choose the UK version. It seems to have the same feel as the other books.